Take a pair of metal salad tongs, and hold one side of the Lifesavers over stove heat (make sure that an adult is doing this portion – this is not for the kids!). When one side of the lifesaver is slightly melted, stick the Lifesaver directly to one of the Fingers Cookies. Make sure any Lifesavers branding is on the inside of the cookie, so the smooth white is outer facing. Add 4 wheels, melted to the 4 corner spots on the cookie, add wheels. Allow to sit and let candy harden. 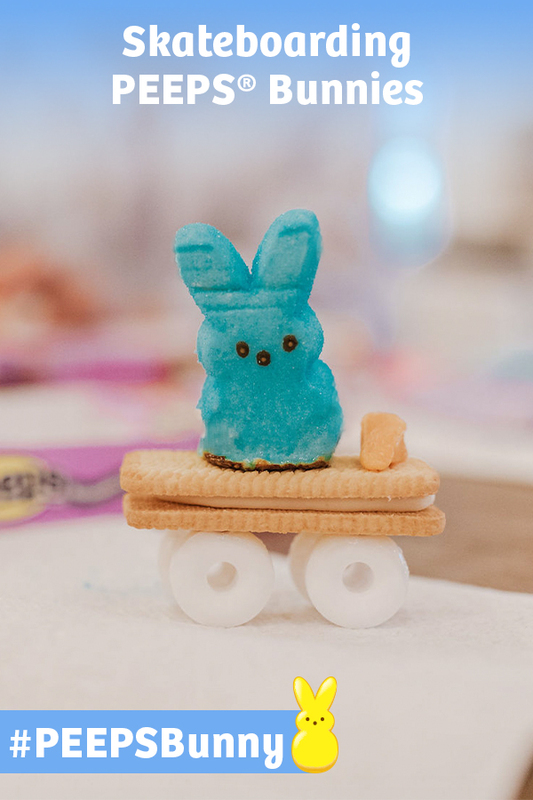 Take one of the PEEPS Bunnies, and melt one side of the Bunny so that it adheres to the cookie “skateboard.” Make sure to only melt the side of the bunny for no longer than 2-3 seconds, as the Bunny will melt quickly and you do not want it to burn. Cut Starburst in 3 pieces, shape into a carrot, add a green from the Sprinkles. Add to the skateboard as the bunny’s mini treat!